The Time of Windows 8 Is Coming. Windows 8 is a revolutionary operating system developed by Microsoft, whose mission is to provide an efficient and effective working platform. It adopted the brand new Window UI interface, which enables users to operate by finger touch as well as by mouse and keyboard. The optimized browse by touch operation provides more faster and smoother experience, and IE10 placed users’ website in the center of Windows 8. Microsoft will stop supporting Windows XP after April 8,2014. However most users have not move into Windows 8 yet. Actually, based on the survey of TechRepublic, although there are alternatives to Windows 8, or business users of XP do not want to transfer to Windows 8, the time of Windows 8 is coming, for Microsoft occupies quite a large percentage in operating system. Then are you ready for the big change? In whichever operating system, as a general user, video editing software is one of the necessities. And among those users, beginners and family users occupies a great proportion. idoo Video Editor is a video editing software for Windows 7/8/xp designed for beginners, whose operation is very easy. More than that, the powerful function of format conversion, crop, join etc. also make it outstanding among similar software. idoo Video Editor also supports editing and conversion of SWF files. As the Windows 8 is coming into the market, idoo Video Editor also keeps the pace with the new features. It will perfectly run under Windows 8 and can video editing for Windows8 to make your editing job more efficient and easier. 1. Clean interface, clear function settings, and it is readily to operate and easy to use. 2. You may preview and play the video before, during or after editing it, and you may also capture the screen and save the picture as the file type you want. 3. It is easy to set the save path of the output files, and they can be also directly opened after being edited. 4. The video editing and format conversion can be done in just one step (idoo Video Editor integrated format conversion with the other functions). 5. In each function, you may check the detailed audio information in “Audio Channel”. The following part will show you the watermark function of idoo Video Editor’s ability under Windows 8/7/XP. 1. 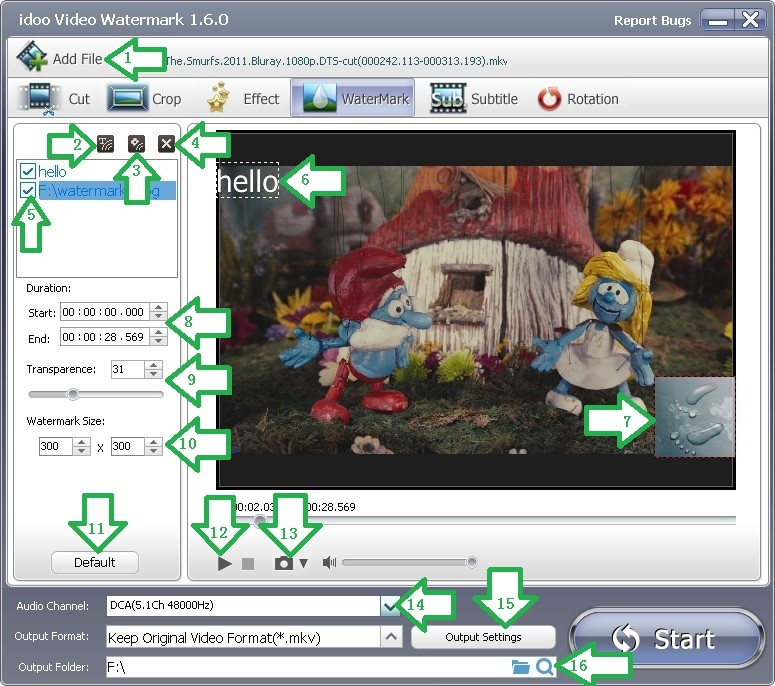 Run idoo Video Editor, and click “Watermark” (Arrow A). 2. Click “Add File” (Arrow1) to select the file to edit. 3. You may add text watermark (Arrow2), add picture watermark (Arrow3) or delete selected watermark (Arrow4). 4. In the area below (Arrow5), it lists the information of the watermark added, and the text watermark may be edited directly in the preview box (Arrow6). 5. Arrow 6 and 7 show the effect of watermarks. By dragging them in preview box, you may decide their positions. 6. Set the start and end time in Duration box (Arrow8), with millisecond precision. 7. Set the transparence in Arrow9 area. Edit the size of the watermark by adjusting the figures in the box (Arrow10). 8. Click “Default” (Arrow11) to cancel current operation and return to default settings. 9. The information of the audio channel can be seen (Arrow14). 10. You may open the folder where output files stored or directly open the output files (Arrow16). 11. By clicking “Output Settings”(Arrow15), the format of the output files can be changed. 12. Click “Start” to begin editing. Then to check the output file or edit it.